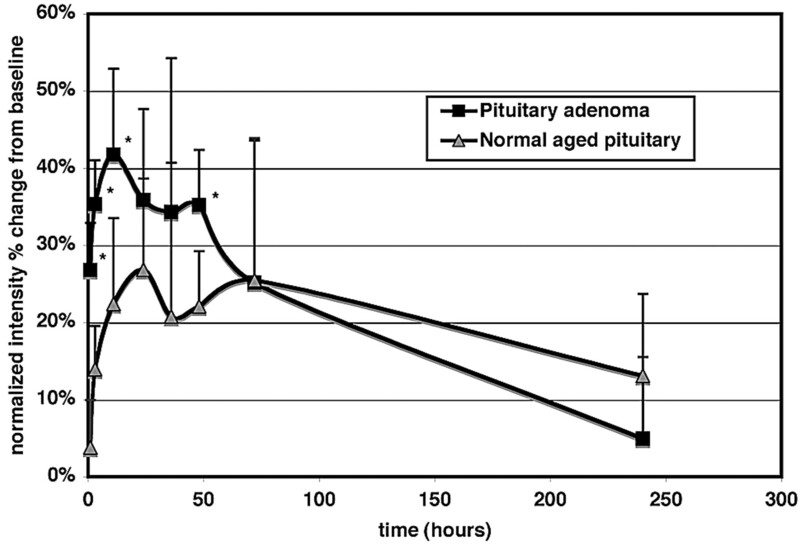 Calcium influx is faster and increased in adenoma versus normal pituitary gland. The vertical axis represents the mean percentage change in intensity from baseline values calculated as the following: (intensity at time point − intensity at baseline) / (intensity at baseline) × 100. The horizontal axis is time in hours postinjection. Error bars show the SD of mean percentage change. The asterisk indicates that differences between the 2 groups reached statistical significance at 1, 3, 11, and 48 hours (P ≤ .05). 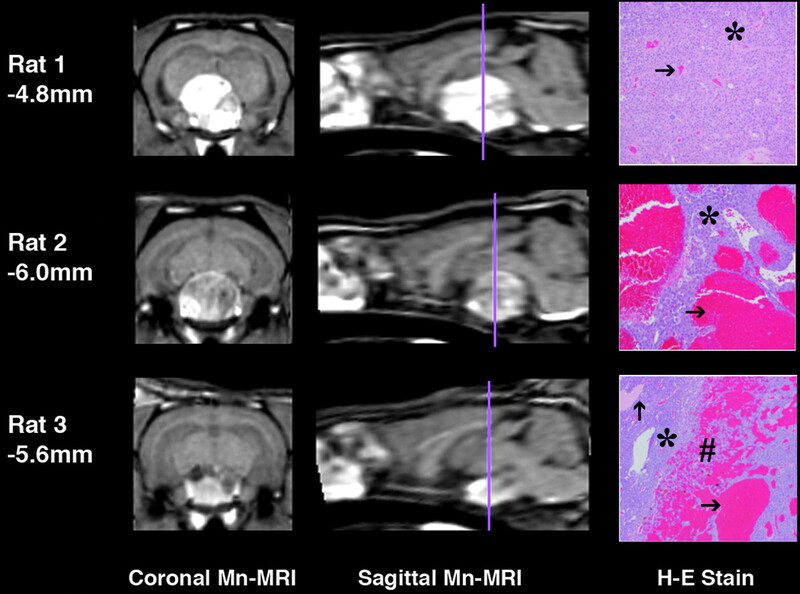 Individual Mn-MR images show enhancement of tumor after 1 hour. First column shows coronal sections of a single representative MR image of normal pituitary enhancement at baseline and 1 and 11 hours postinjection (small black arrow). Other columns show coronal sections of each individual subject with pituitary adenoma. Adenomas of individual subjects show clear enhancement at 1 hour postinjection (large black arrow, middle row), which continues to increase for 11 hours (large black arrow, bottom row) and allows superior delineation of the tumor/brain border over nonenhanced baseline images. Verapamil alters Mn2+ uptake in the olfactory bulb and pituitary gland. Change in intensity with time in the olfactory bulb was modulated by different doses of verapamil injected intranasally before MnCl2 administration (A). 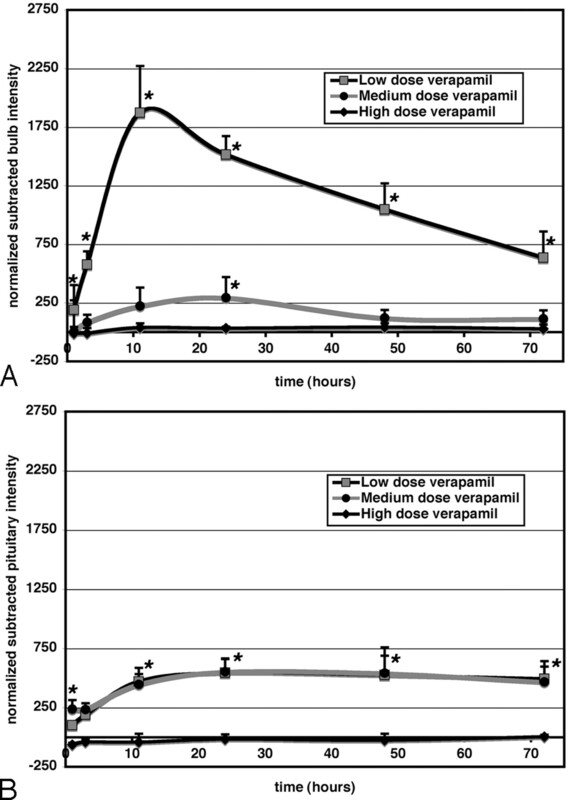 In the same subjects, VOI in the pituitary indicates that low- and medium-dose verapamil have a nearly identical effect on uptake; however, uptake remains virtually extinct with a high dose (B). The vertical axis represents normalized intensity for VOIs in the right olfactory bulb and in the pituitary gland that have been subtracted from baseline values. The horizontal axis is time in hours postinjection of MnCl2. Error bars show the SD of mean change in intensity. The asterisk indicates differences that reached statistical significance (P ≤ .05). FDG-PET versus Mn-MR imaging: single subject. Coronal sections through pituitary tumor of rat 2. Left column shows tumor 1 hour after intranasal administration of the calcium analog Mn2+. Right column shows an FDG-PET scan of tumor glucose metabolism. Single arrows (white on MR imaging, black on PET) indicate region of high glucose metabolism correlating with high calcium influx. Double arrows (white on MR imaging, black on PET) indicate low glucose metabolism and calcium influx in the area of necrosis. Mn-MR images of individual subjects show correspondence to H&E stain. Coronal 3D-SPGR images through a pituitary adenoma at 11 hours post-MnCl2 injection show different patterns of uptake between different subjects. Histologic sections are from paraffin-embedded H&E-stained pituitary tumors. Rat 1: The tumor is composed of principally solid sheets of neoplastic cells (asterisk) and a few small-caliber capillaries (arrow) with minimal hemorrhage. Images for rat 1 indicate intense more uniform uptake of Mn2+. Rat 2: Note the large dilated vascular and cystic spaces within the tumor section (arrow) and cords of neoplastic cells (asterisk). Rat 3: Note area of hemorrhage within the tumor parenchyma (number sign) and dilated vascular and cystic spaces (arrows) within cords of neoplastic cells (asterisk). MR images of rats 2 and 3 have less-intense uptake with a more heterogeneous appearance, which may correspond to hemorrhage and cystic spaces on pathology. Purple line indicates location of the coronal section on the sagittal image. All sagittal sections are from the midline. The number beneath each subject indicates the distance of the coronal section in millimeters from the bregma landmark.20 (All histologic sections, original magnification ×10). 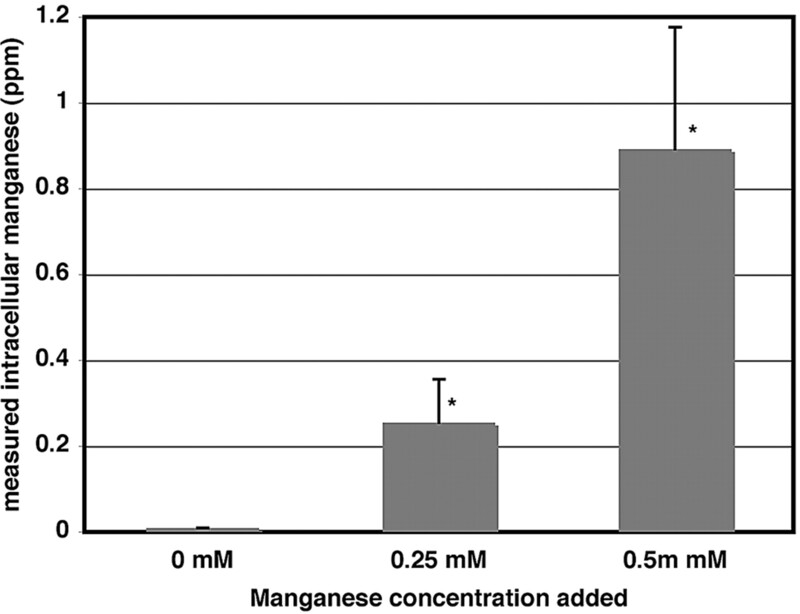 Manganese content in cells is increased with higher concentrations of MnCl2. Graph shows intracellular Mn2+ (parts per million [ppm]) for 2 concentrations of MnCl2 incubated with GH3 cells compared with vehicle alone. Error bars show SD of multiple samples. The asterisk indicates significant increase (P ≤ .01).